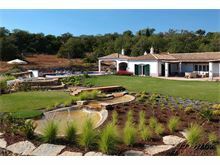 Converted into a beautiful villa from an old ruin, Quinta das Pedras is located just outside the quiet village of Sobradinho and is the perfect tranquil hideaway that has far reaching and spectacular views of the Algarve countryside. The beautifully maintained garden, with a great lawn for children to run about, has a large south-facing pool and fabulous outdoor kitchen area with plenty of outdoor seating, perfect for everyone to get together and enjoy a delicious barbecue. 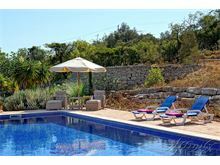 Inside the villa is very comfortably furnished and provides ample space for a family or group of friends holidaying together and as the villa is all on one level, it is also suitable for young children or clients who experience difficulty walking. 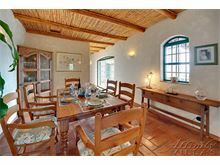 All living areas have large French doors leading to the garden or terraces. Although in the heart of the countryside, Quinta das Pedras is still very close to the town of Loule and the popular coastal resorts making it the perfect villa for those wanting to enjoy everything this area has to offer. Approximately 6km from the busy market town of Loule with an abundance of shops, bars and restaurants. 20kms from the beach. At the entrance, electric gates open to the cobbled drive which leads straight to the front door. Entrance hall opens into a wide corridor, off which is the guest cloakroom. 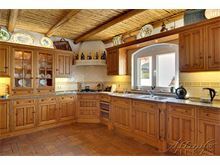 Large country-style kitchen with dining area and separate utility room with washing machine. 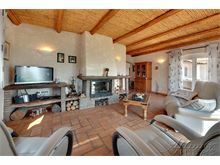 Large sitting room with reclining sofa seating, TV and feature wood burner. Dining area with corridor leading to the bedrooms. 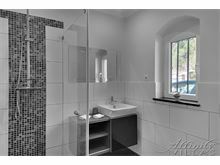 Double bedroom with en suite bathroom with Jacuzzi bath and separate shower. 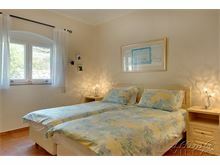 Two further twin bedrooms both with en suite shower. Maid service twice per week. 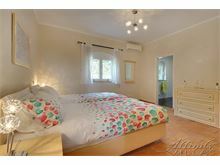 Air conditioning (bedrooms only), pool heating and WiFi available at extra cost, if required. 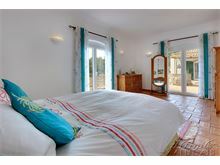 We have just returned from a wonderful week's holiday at Quinta das Pedras. The pool, gardens and BBQ area were outstanding. We thoroughly enjoyed our time there and found the location quite but within easy reach of restaurants, supermarkets and the coast. The villa was better than we thought it would be, the view was far better than the brochure stated. The house manager was excellent and we all would like to thank her very much. 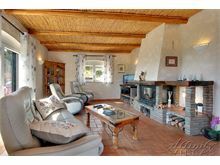 A lovely attractive villa in the hills outside Loule. 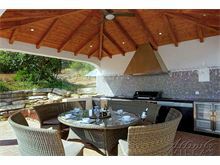 Well furnished and landscaped with a superb covered barbecue/kitchen and seating area by the pool - all meals were eaten here! Facilities and furnishings were well provided and security well covered. There were no nearby restaurants in walking distance but plenty within a twenty minute drive and there were a number of supermarkets in Loule. 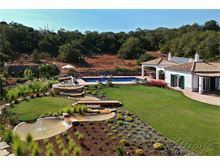 It is situated with easy access to both the east and west Algarve using the A22 or other local routes but roads around the villa are very quiet with little traffic noise. 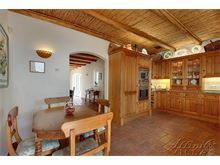 Villa is in a wonderful elevated position with lovely views, secluded but not far away from facilities. Great large pool and grassed area. We all enjoyed our relaxing stay. Quinta das Pedras was everything promised in the Affinity description and then some more. We spent most of our time outside in the huge dining/kitchen area, which had it's own fridge and dishwasher, together with the large, mains gas connected, bbq. From there a few steps to the large pool. As the sun rose we had breakfast in the courtyard area with views over the gardens and water feature. 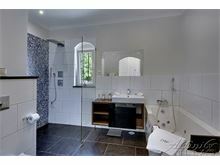 The bedrooms were all large with beautiful en-suite facilities. 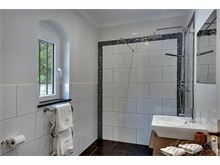 The master bathroom was superb with Jacuzzi bath, walk in shower with electric controls. Plus is was all so peaceful. As we left we were checking availability for next year - we will be going back. We had a fantastic holiday at this villa. When we first drove into place we thought we'd come to the wrong place as the photos didn't do it justice. The outside space is amazing, with a wonderful pool, beautiful gardens and the amazing outdoor kitchen where we ate all our meals. There are lovely views of Loule and the town itself is well worth a visit, particularly if you're a bit of a foodie. The surrounding area is lovely and quiet and perfect for relaxing.